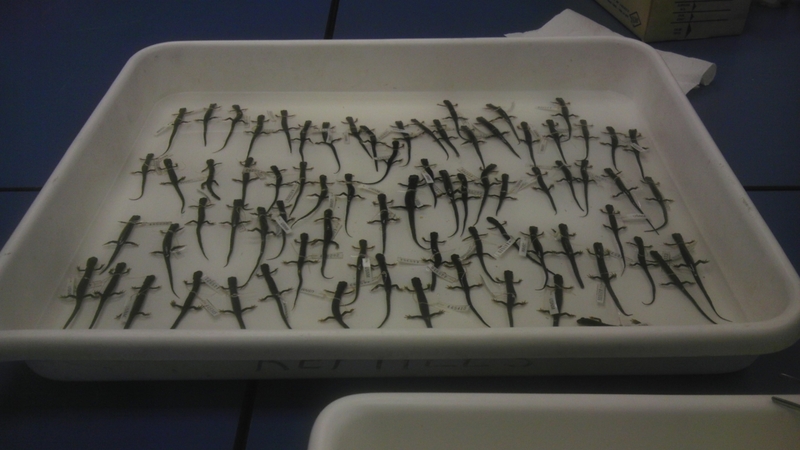 This tray full of northern-cheeked salamanders, collected decades ago by Prof. Richard Highton, are stored in a Smithsonian Institution in Suitland, MD Karen Lips and colleagues used them to show that Appalachian salamander species are getting smaller in response to climate change. That's the key finding of a new study, published March 25 in the journal Global Change Biology, that examined museum specimens caught in the Appalachian Mountains from 1957 to 2007 and wild salamanders measured at the same sites in 2011-2012. The salamanders studied from 1980 onward were, on average, 8% smaller than their counterparts from earlier decades. The changes were most marked in the Southern Appalachians and at low elevations – settings where detailed weather records showed the climate has warmed and dried out most. Scientists have predicted that some animals will get smaller in response to climate change, and this is strongest confirmation of that prediction. "We don't know if this is a genetic change or a sign that the animals are flexible enough to adjust to new conditions," Lips said. "If these animals are adjusting, it gives us hope that some species are going to be able to keep up with climate change."